By design, data placed in the blockchain is visible to everyone in the world and can never be removed; everyone who mines bitcoin makes a copy of the blockchain, and so any illegal content stashed in the blockchain ends up on the computers of every miner. Many governments make possession of certain materials -- state secrets, images of the sexual abuse of children, copyright infringing materials etc -- a civil or even criminal offense under any circumstances. In order to investigate whether this means that bitcoin miners are all in possession of illegal data, a group of German researchers conducted a census of "arbitrary blockchain content" that had been stashed in the blockchain through methods like CryptoGraffiti, the Satoshi Uploader, P2SH Injectors, and Apertus. They found that there is already a lot of potentially scary stuff stashed (forever) in the blockchain, including extensive links to sites that host images of the sexual abuse of children, backups of the Wikileaks #cablegate data, pro-democracy news that has been banned in China, etc. This is interesting: on the one hand, it will give authoritarian regimes a perfect rubric for cracking down on Bitcoin ("Every bitcoin miner is a child pornographer! "); on the other hand, it can raise the price of censoring leaks related to government misconduct to the entire value of a nation's cryptocurrency transactions and assets. The seriousness of objectionable content stored on public blockchains has been motivated by multiple works [56,57,43,11,40,51]. These works, however, focus on reporting individual incidents or consist of preliminary analyses of the distribution and general utilization of content insertion. To the best of our knowledge, this paper gives the first comprehensive analysis of this problem space, including a categorization of objectionable content and a survey of potential risks for users if such content enters the blockchain. In contrast to previously considered attacks on Bitcoin’s ecosystem [22,27], illegal content can be inserted instantly at comparably low costs and can put all participants at risk. The utilization of chameleon hash functions  to chain blocks recently opened up a potential approach to mitigate unwanted or illegal blockchain content . 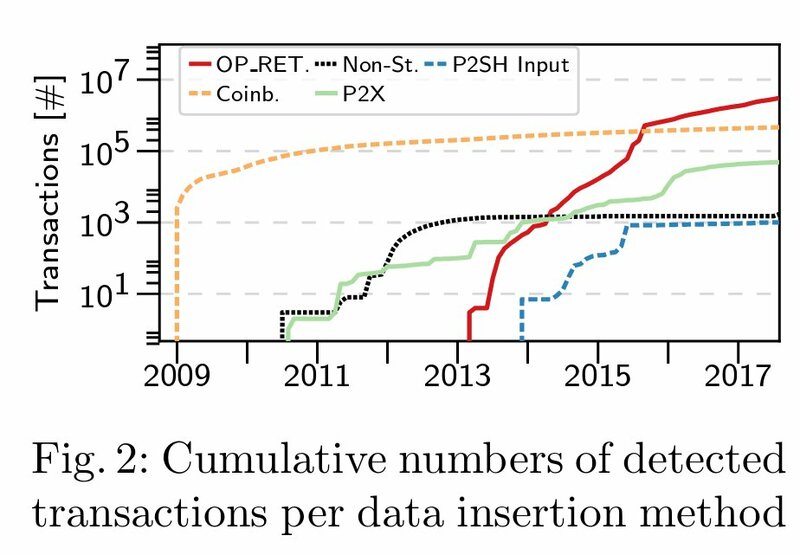 Here, a single blockchain maintainer or a small group of maintainers can retrospectively revert single transactions, e.g., due to illegal content. To overcome arising trust issues, μ chain  leverages the consensus approach of traditional blockchains to vote on alterations of the blockchain history. As these approaches tackle unwanted content for newly designed blockchains, we seek to motivate a discussion on countermeasures also for existing systems, e.g., Bitcoin.